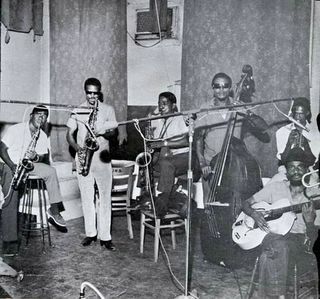 All-About-Jazz: What’s the difference among ska, reggae, and rocksteady? Ken Stewart: It’s really just the same rhythm slowed down. The way the bass plays - [Lloyd] Brevett was talking about the walking bass in the ska - that’s basically the difference between ska and rocksteady. Rocksteady was when the bass line started to get more repetitive, and the choral [sic?] structures were less complicated and slower. As reggae came in, it’s just the same thing, basically. Electric instruments were coming in. The acoustic bass was kind of out because the bass lines were so fast that they got kind of muddy with a string bass. So the electric bass was a lot clearer and, of course, more of a punch. i'm pretty sure he said, or meant to say, "chordal" structures. but still, sounds right on to me. and just to prove it, here's a reggae song turned into a ska song, purely through tempo manipulation. mind you, it's not a great piece of work, especially for a ska song. (the bassline's too bubbly, not enough horns, and yeah, the effect on the voice is a bit weird at times.) but it makes a point, at least in terms of the relationship between style and tempo, ska and reggae. "Screw-up" vs. "unscrewed": agreed and duly noted. I will edit my description of your reremix, which I just posted. To the memory hole with "unscrewed". oops. i fear i've only confused my clever neologism in an attempt to be more clever. i'd still call those uptempo screw numbers (whose pitch remains screwed) "unscrewed"; whereas this type of track, maintaining original pitch but faster in tempo, seems like a "screw-up." probably not an important distinction ultimately. but i'd hate to lose "unscrewed." so perhaps you can duly note that, too. not important, though. sorry to cause multiple edits at any rate. thanks for the riff! OOPS! My bad! I got a little over-eager. What can I say? I have an irrational enjoyment of jargon. And changing nomenclature looks like such fun when Karl Rove does it! ; ) Re-re-fixed the description of the re-re-mix. i feel you. surely you can agree then, that two terms is better than one! thanks for the lil' fix. glad the "nuclear option" was avoidable. i'm sorry, i meant "constitutional option." yeah, that's got a much better ring--and it means the same thing, right? "Chase the Devil" is one of my all-time favorites. I dunno if I "like" this version (it makes me a little on-edge, like is an animatronic Michael McDonald gonna jump out and get me?) but it definitely proves your point. yeah, i apologize for the quasi-sacrilege. it's one of my favorites, too, which is why it was a sitting-duck--already on my computer, just waiting for a little warp-speed. i've already been warned about messing with the doobie brothers, though, so maybe i'm getting myself into dangerous territory here. what's next? making a ragga-jungle version of a reggae version of michael jackson's billie jean? oh, wait a minute. Two terms most definitely better than one. I may be pulling out some additional screw/unscrew-up techniques in the very near future, at which point some additional jargon may be unavoidable. I hope that I may consult with you on appropriate nomenclature, because clearly I cannot be trusted to stay "on message" on my own. to me, the term screw involves tempo AND pitch changes so.. scrunch(-up? ): the opposite of time stretching, where pitch remains the same, tempo increases..